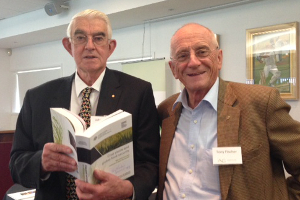 The Crawford Fund’s ACT Committee coordinator, Dr Tony Fischer, today released a book, co-written with other eminent agricultural scientists Drs Derek Byerlee and Greg Edmeades. The key finding of Crop yields and global food security: will yield increases continue to feed the world? is that the most effective way to advance food security and protect the environment is through continuing progress in lifting crop yields across the globe. “The debate around food security includes argument around trade policy, lagging research, water shortage, land degradation, biofuel cropping and climate change, and ways to reduce demand including changing diets and reducing food wastage. However, the most effective way is through ongoing yield increase,” said Dr Fischer. Dr Fischer says boosting investment in agricultural research, development and extension, are essential for future yield growth, but so too are huge investments in better institutions, infrastructure and policy, especially in the developing world. Dr Fischer is the former head of the Wheat Program at the International Maize and Wheat Improvement Centre (CIMMYT) in Mexico. In Australia, he headed the soil and crops program at the Australian Centre for International Agricultural Research (ACIAR), was on the board of the Grains Research and Development Corporation (GRDC) and is an Honorary Researcher at CSIRO Plant Industry. The Crawford Fund organised the launch of the book by Dr John Dixon from ACIAR at the conference of the Australian Institute of Agricultural Science and Technology (AIAST) in Brisbane, which was opened by our Chair, the Hon John Kerin and attended by a number of our board members. The book was published with assistance from GRDC. The 640-page book can be downloaded or purchased from the ACIAR website (A$85, incl. GST, plus postage). 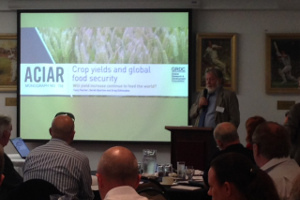 ACIAR website: Crop yields and global food security: will yield increase continue to feed the world?